We partnered with Dr. Josie Ahlquist for our newest research that examines the online presence of higher education executives. Josie’s experience with digital engagement, influence, and leadership partner well with our analysis expertise to offer higher education execs an authoritative source they can use to shape their digital presence. Campus Sonar Social Media Data Analysts researched, listened to, and analyzed the digital presence of 194 higher ed presidents and vice presidents over six months, segmenting them into: presidents vs. vice presidents, institution type and size, length of time in current position, and geographic region. 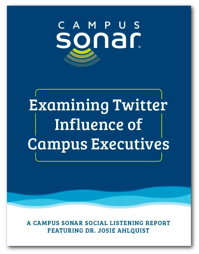 No particular institution type, size, or executive role leads to greater online influence for higher ed executives. However, the most influential presidents differed from the average president—they were younger, more racially diverse, and more likely to be male. Historically Black College or University (HBCU) presidents outperformed their peers in social media influence. All of the executives in our top 10 influencer list manage their own Twitter accounts. Executives are most active Monday through Friday, although they are online through the evening (generally until about 9:00 p.m.), and tweet two or three times per day on average. Executives tweet text and image posts most frequently, tweeting very few videos or links. Text-only posts are most likely to elicit replies (i.e., start a conversation). 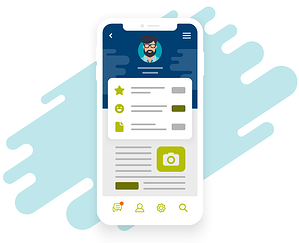 Another major takeaway is that authenticity—posting things that are truly interesting and personal about themselves—is a universal characteristic that makes an executive most impactful online. Creating an intentional digital presence is something that Josie advocates in her coaching program, The Connected Exec. Download the report to learn more about our research, including who the top 10 influential executives are, the general sentiment of executive tweets, emerging content themes, and more.